Just to clarify a little on the Sept. 4th date, Zach mentioned that these should be available around that date, but the 4th might be the date when DST is supposed to deliver the product to Walgreens, not necessarily the date they actually hit stores. The actual release could be a few weeks on either side of Sept. 4th depending on when the shipment is delivered. Plus, there's also Attuma, Justin Hammer and the Super-Adaptoid. To be honest, I'd be down for all of them, even if it meant buying more Hawkeyes. No, September 4 is the planned On Sale date for the Marvel Animated wave at Walgreens. It is not an embargo date, so some stores may put them out before or after, but that is the target release date. I do not know when the Ultimate Spider-Man wave will hit TRU, but presumably by this summer. I need to double-check how we will be expanding on GotG and the Avengers in Series 2, but I'm sure we'll see more of both at some point. It is Carnage. His appearance and origin are different from the comics. Wow.....I like these a lot, and I think having the cartoon 'mates in TRU is a great marketing plan to get more mass market appeal. Face it, if a kid walks in and sees Ultimate Spider-man from a cartoon he watches, or Moon Knight, it's no question which gets the sale. 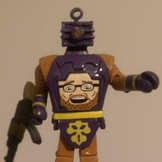 And any new converts to minimates is a good thing! My only issue so far is that Nova's helmet is black, when it's yellow in the cartoon, I'm sure that will be fixed by the time the figure comes out. The 2099 and Agent Venom look great! And I love the "Wtf?" face on the ultimate spidey - really captures the spirit of the cartoon. I'm loving the Alt faces , Not to keen on that sandman especially since we just got a perfect one at lukes ... But spider 2099 sold anymore definition then the original is great , and of course the guardians pack I like em , is there any confirmation that rocket well have movement ? Rocket will not have movement. Not interested in these animated style minimates, but I will probably pick up the guardians and spiderman 2099 packs for customization purposes. Squadron Supreme is in that show? Sweet! We can say we almost have Justice League minimates if they come out! Ah. Just looked it up in the wiki, looks like Sam got the black helmet in later episodes. Guess I'm behind in my USM watching. I'm not sure if I'll be adding these to my collection. So many of these look an awful lot like 'mates I already have. I'm not a fan of GOTG outside of the movie. The only cartoon designs I'd be interested in would be the ones unique to the shows. That said, I really don't like the Falcon's second season outfit. This might the first line I'll be cherry picking in a loooong time. Hopefully they'll do well at Walgreen's. I'm more confident I'll find them there than at TRU. i kinda dig Falcon's new suit. he looks like a member of G-Force. Does Walgreens sell toys online? The nearest stores are an hour away & my work schedule/kids make my toy runs few and far between. Now that's an animated mini mate. Also NSFW as I just found out. That FF Sandman will definitely go into my collection, I absolutely love the costume that's based off of. I've wanted that look for ages and can't wait to add that one to the shelf. Any chance it comes with alternate green legs? That would make it perfect and like the Ronan mate, I would consider it close enough and done. Short jacket Starlord is a great idea but I already made one with a WD Zombie red jacket so not sure I need to purchase that one "again". Still, I'll take a look and I'm a sucker for the impulse in hand purchase. I'm sure they'll have it online, when they got the exclusive Agent Venom Marvel Legend, I ordered mine online.